"I love turnips. 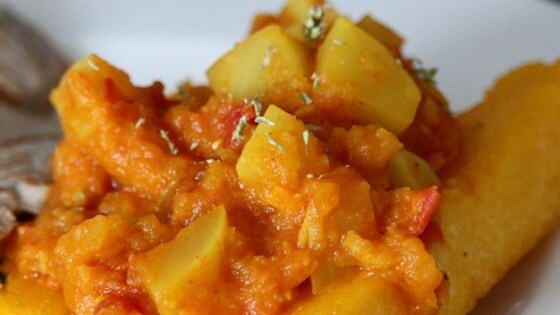 This Northern Indian dish is great way to spice up traditional mashed turnips. This dish is great garnished with fresh cilantro or parsley and served with basmati rice, or with naan bread. The amount of chiles you use really controls the heat factor in this dish." Heat oil in a large saucepan over medium heat. Add onion; cook and stir until soft, about 10 minutes. Stir in ginger-garlic paste and chile peppers; cook until fragrant, about 1 minute. Stir tomatoes, coriander, cumin, turmeric, and salt into the saucepan; mix well. Add turnips and hot water; stir well. Cover and bring to a boil. Reduce heat and simmer until turnips are tender, 20 to 30 minutes. Add brown sugar and coarsely mash the turnips. Easy, delicious, breaded tofu that's perfect as a main course! Homemade ginger-garlic paste can be made by mashing equal parts garlic and fresh ginger root into a paste. Absolutely delicious! Thanks for sharing this recipe. Eye grow my own turnips now so this recipe was a godsend! This was delicious! I didn't have fresh tomatoes, so I used a can of crushed tomatoes. Absolutely delicious. A new recipe for my "keeper file". Thank you for the recipe.